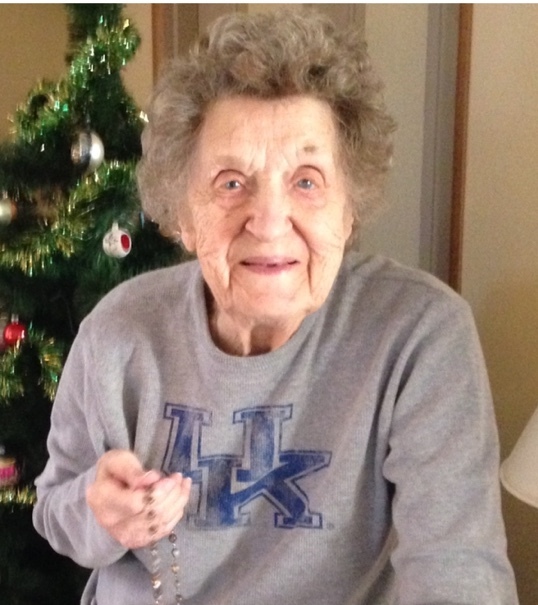 Freda Frances (Kitz) Ward, age 92 of Georgetown, Ohio went to Heaven, Thursday, September 6, 2018.She was a resident of the Locust Ridge Nursing Home in Williamsburg, Ohio. She was a sixty-eight year member of St. George Catholic Church in Georgetown, Ohio. Freda was born December 12, 1925 in Covington, Kentucky the daughter of the late Fred and Frances (Kreke) Kitz. She was also preceded in death by her husband – James L. Ward and three brothers – Fred, Daniel and Robert Kitz. Mrs. Ward is survived by one son – Robert Ward (Connie) of Russellville, Ohio; two daughters – Jean Leibold (Mark Perrine) of Higginsville, Missouri and Mary Jo Wallace of Winchester, Ohio; six grandchildren – Brian Ward of Lebanon, Ohio, Tara Ward of Chicago, Illinois, Michael Thomas (Jennifer) of Ramona, California, Randy Leibold (Michela) of Montrose, Missouri, Carrie Wheeler (John) of Seaman, Ohio and Cindy Erwin of Seaman, Ohio; seven great grandchildren; one sister-in-law – Wyoma Kitz of Constance, Kentucky; nieces, nephews and special friends. Mass of Christian Burial will be held at 11:00 A.M. Monday, September 10, 2018 at the St. George Catholic Church in Georgetown, Ohio. Rev. Dohrman Byers will be the Celebrant. Visitation will be from 9:30 A.M. – 11:00 A.M. Monday at the Cahall Funeral Home in Georgetown, Ohio. Interment will be in the Linwood Cemetery in Russellville, Ohio. The family would like to thank the staff at Locust Ridge Nursing Home, Hospice of Hope, members of St. George Catholic Church and Rev. Dohrman Byers and Joan St. Clair for their devotion, love and prayers.